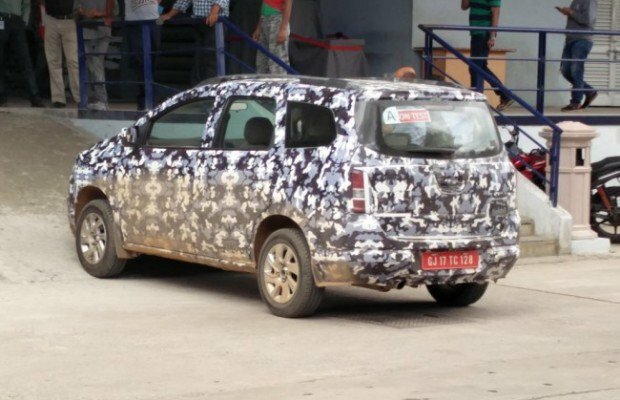 A new Multi-Purpose Vehicle (MPV) from General Motors named Chevrolet Spin was spotted testing in India. The Chevrolet Spin MPV, which is expected to be launched next year was going through testing when spotted on the roads of Bangalore. Chevrolet‘s Talegaon plant will be manufacturing this MPV . Chevrolet Spin is very likely to be called as Chevrolet Essentia in India. The Spin MPV from Chevrolet is going to be powered by a 1.3-litre diesel engine that is capable of churning out upto 90bhp of power and would be mated with a five-speed manual transmission gearbox. As per the reports, Chevrolet Spin is going to be a 7-seater MPV and will be strategically placed above the Chevrolet Enjoy, which is one of the prominent cars in Chevrolet’s portfolio. The Spin from Chevrolet would be competing against the likings of other MPVs in the market like Honda Mobilio and Renault Lodgy. If Spin/Essentia entering the market is confirmed, totally Chevrolet is going to have 3 MUVs in its Indian portfolio – Tavera, Enjoy and Spin (Essentia). The Chevrolet Spin Test car was spotted by a Team-BHP reader and was then reported by MotorOctane Auto Portal. The upcoming Chevrolet Spin is going to be launched both as an MPV and a SUV. The Chevrolet Spin SUV format will be a 5-seater and shall be powered by same engine. The SUV will take on likings of Ford Ecosport and the Maruti YBA. Spin Activ could be named as Ultiva for the Indian car market and this will be also launched in 2016 along with the Spin (Essentia). The price of Chevrolet Spin / Essentia shall be priced at INR 8-11 lakhs (on-road price). The company is expected to launch 5 new models in next 5 years.